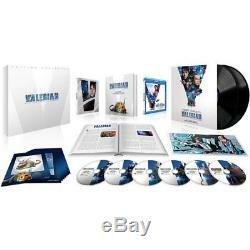 Blu-ray - valerian and the city of a thousand planets - collector box lim edition. Product Descriptionvalerian and the city of a thousand planets - limited edition collector's box - blu-ray combo 4k + blu-ray 3d + blu-ray + dvd [limited edition 4k ultra hd + blu-ray 3d + blu-ray 2d + blu-ray discover more about lunivers dalpha a double vinyl of the original music of the film, composed and directed by alexandre desplat and interpreted by the national orchestra of france (23 titles) an exclusive lithograph drawn by jean-claude mézières, in limited edition and numbered a guide of characters of 51 pages 8 postcards collector containing the preparatory drawings of the characters and their final versions a documentary filming valeriansynopsisau the 28th century, valérian and laureline form a team of agents spatio- of time to maintain order in human territories. Mandated by the Minister of Defense, the duo goes on a mission on the? Extraordinary intergalactic city alpha - a rapidly expanding metropolis where species from all over the world have converged over the centuries to share their knowledge, know-how and culture. A mystery hides in the heart of alpha, an obscure force that threatens the peaceful existence of the city of a thousand planets. Valerian and laureline will have to race against the clock to identify the terrible threat and safeguard not only alpha, but the future of the universe. Actors: dane dehaan, cara delevingne, peter hudson, xavier giannoli, louis lerrierrealizers: luc bessonformat: color, 3daudio: english (dts-hd 2.0), french (dts-hd 2.0) subtitles: frenchregion: region b / 2 more information on dvd / blu-ray formats. Number of discs: 4studio: europacorpdate of the DVD release: 4 december 2017 duration: 137 minutes. Product Description valerian and the city of a thousand planets - limited edition collector's box - blu-ray combo 4k + blu-ray 3d + blu-ray + dvd [limited edition 4k ultra hd + blu-ray 3d + blu-ray 2d + blu discover more about the universe dalpha a double vinyl of the original music of the film, composed and directed by alexandre desplat and interpreted by the national orchestra of france (23 titles) an exclusive lithography drawn by jean-claude mézières, in limited edition and numbered a guide characters of 51 pages 8 postcards collector containing the preparatory drawings of the characters and their final versions a documentary on the shooting of valerian synopsis in the 28th century, valérian and laureline form a team of spat agents io-temporal responsible for maintaining order in human territories. Actors: dane dehaan, cara delevingne, peter hudson, xavier giannoli, louis leterrier directors: luc besson format: color, 3d audio: english (dts-hd 2.0), french (dts-hd 2.0) subtitles: french region: region b / 2 more information on dvd / blu-ray formats. Number of discs: 4 studio: europacorp dvd release date: 4 december 2017 duration: 137 minutes. We do not deliver post boxes or military bases, thank you to take into account when ordering. Followed letter - 0.00. Post - international economic mail - 7.90. For more information on delivery, click on more info. Sorry, our products are not available for withdrawal in store. On request, we offer the possibility to pay by bank transfer. No checks will be accepted. The law n 81-766 of August 10, 1981 relative to the price of the book, known as law lang (of the name of jack lang, minister of the culture), is a law establishing a unique price of the book in France. Ask the seller a question. Manga - academy alice (the) vol. Manga - princess sakura vol. Manga - nijika, dream actress, tome 3. The buyer pays the return costs. Returns are possible for 14 days after receipt of your order. The return costs are the responsibility of the buyer. Please note that according to the regulations in force, the right of withdrawal can not be exercised for customizable books, audio recordings, video or computer software unsealed by the customer .. books will not be resumed if they show traces folds, pages cornea, writings ..
the item "blu-ray valérian and the city of a thousand planets box collector lim edition" is on sale since Tuesday, June 19, 2018. It is in the category "dvd, cinema \ dvd, blu-ray. " The seller is "around_the_clock" and is located in /leans. This item can be shipped to the following country: europe.